Strikingly unique, these floor air vents are featured in the Rockwell design which takes a classic look and puts a modern spin on it. Our plated polished brass register covers are made with 3mm steel and are protected by a lacquer to help prevent tarnish and corrosion. 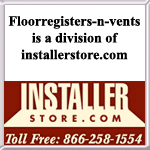 The floor air vent installation process is a snap, just drop the brass register covers into your floor opening. Our brass register covers also can be used for wall registers for those looking to re-do entire rooms. The floor air vent simply needs to be attached with special mounting clips. Adjusting brass register covers with metal damper, will allow you control to open up or close off the floor air vent for desired airflow. Tip: To order the correct brass register covers, do not measure existing registers. Instead, a 4 x 10 hole opening will need a 4 x 10" floor air vent. All of our floor air vent can be wall mounted with these wall mounting brackets. These decorative brass register covers cannot be used on the ceiling. 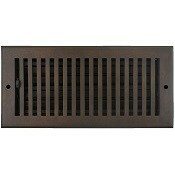 Different floor air vent designs or finishes are also sold on this website. Polished up your style with brass register covers that are sure to brighten up your day. Order these now!